Books - Marnie Cooper School of Acting, Inc.
ORDER NOW AND DOWNLOAD INSTANTLY! Marnie Cooper, a former child actor and longtime student of acting herself, is one of the most successful and highly regarded acting coaches for children and young teens in the country. Marnie’s kids have been nominated for Emmys, Cable ACE awards, and Tonys. They’ve won Camie, Peabody, and Young Artist awards. Marnie knows acting. She knows kids. And she knows how to put the two together with spectacular results. Here, for the very first time, she reveals exactly how she does it, her own unique and phenomenally effective method. 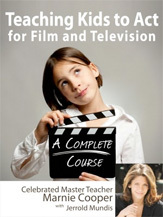 In *Teaching Kids How to Act for Film & Television* she shows you—you the parent, the teacher, the coach—in simple, clear detail how to teach your child or other people’s children how to audition, book roles, act for film and television, and have absolutely the best chance of becoming wildly successful in the industry. This is Marnie-in-a-book. Marnie right there beside you, teaching you how to teach your child. If your child has any interest at all in acting for film or television, or if you wish to teach other people’s children how to do that, you will almost certainly want this book, want to have Marnie at your side. Here are just a few of the many accolades Marnie has received for her knowledge and her work. Marnie is ready to help you and your child. Right now.